The 1st Annual SNUPS Photo Shootout kicked-off last weekend in Anilao and I was glad to be able to participate. This is the first time ever that I join in any photo competition, except for the monthly social thingy during NUDI night. I was not competitive, but I definitely felt the HEAT. SNUPS is a photo competition collaborated by NUDI and Splash Underwater Imaging. It’s a series of underwater shoot-out to be held in 3 of the top diving destinations in the Philippines: Anilao (Batangas), Dauin (Dumaguete), and Mactan (Cebu) at one week interval. Each destination are given 5 days for shooting. A person can register at all destinations since they happen on different weekends. The registration fee of $35 allows you to submit a maximum of 4 photos in the following themes: (1) Macro, (2) Wide-Angle, (3) Marine Animal Behavior, and (4) Marine Animal Portrait. You can submit all macro photos or all wide, but if you submit one of each theme, you will have a portfolio that could win you the Splash Photographer of the Year. There are 2 categories: DSLR and Compacts. It’s a worthy mention that the total prizes for this event is worth over USD 18,000. It includes housing by Hugyfut, Ikelite, and Tubbataha liveaboard dive trip to name a few. Zara and I arrived MAK Diver at 7:30 a.m. on Satruday (May 21, 2011) to register. We then all met up at Acacia Resort and Dive Center which was our lovely home for the weekend. The other divers we dove with were Jerome, Marie, Joy and Eric. We planned for 2 days dive, with one day of all wide angle and another day all macro dives. After all the fizz and fuss, finally at 10am we’re off to our first dive. We wanted to do Beatrice but the current was crazy we decided on Kirbys. When we get to the site, Marie discovered she didn’t bring her masks and fins, haha. So she had to sit this one out! First time it happened to her, and of course it had to be during a tense photo shootout weekend. But I had to give it to her for being cool about it. Ike and Baby were supposed to join us on our 2nd day dive (their first day dive). And we’ve talked to death during NUDI night and constantly coordinating with text messages and facebook. After our first dive on the 2nd day, we went back to the resort at 9 a.m. waiting for their call and calling them. We thought they should be done registering at this time but we didn’t hear back from them, so we assumed they went ahead diving so after our breakfast, we left for our 2nd dive, only to received a message from them at 1,30p.m. that they had their phone off and was waiting for our call. What?? After the first dive on the first day, we went back to Acacia for our very appetizing lunch buffet, albeit a quick one. We were on a mission after all. During the meal we discussed how unfortunate that Eric weren’t able to take any photos because his Patima S95 housing wouldn’t fit Marie’s S90. Eric’s own S95 is being serviced in Canon. Then he offered me to try out his housing since I have an S95. And we remembered that my Ikelite housing can fit S90. So it worked out great! We exchanged housings (for the day only, I wish otherwise of course) and everyone had camera. My dive friends all know how I’ve, for years, said that I don’t need strobes and I found reason not needing it seeing Ike’s photos. And that I don’t want strobes because it’s such a hassle. But Eric here, his Patima housing has an Inon Z240 attached to it. And it turned out not much more of a hassle than carrying the FIX LED of mine that weighs a ton. And the photos… oh my gosh, I’ve never taken better wide angle underwater photos. It just lit everything up like daylight! No wonder I had no reef scape to submit for the NUDI competition. Well, now I do. We did a total of 6 dives over the weekend. There was a plan to do a night dive on Saturday but rain started pouring early evening, we decided to forgo it for an earlier dive the next day. We did the following dive sites for our wide angle day: Kirbys, Beatrice, and Dari Laut. I was so lucky to have strobes this day, the first time ever even on loan, so I was able to get some beautiful shots of the reef and wreck. For macro day, we went to Sun View and Bethlehem (twice). These are not so popular dive sites for non-photographers but a haven for macro lovers. I set a new dive time record in Sun View at 92 minutes! A lot of people asked how we are able to do it, the answer is simple, stay shallow and hold your breath when taking a shot. So in effect, the more photos you have, the more air you conserve. haha! I’m kidding–don’t ever stop breathing underwater! After participating in Dive Seafari last month, talking to Joel (Uichico), and meeting and diving with professional photographers, I have come to understand the role of a good dive guide. And realize how lacking of them we are in the Philippines. 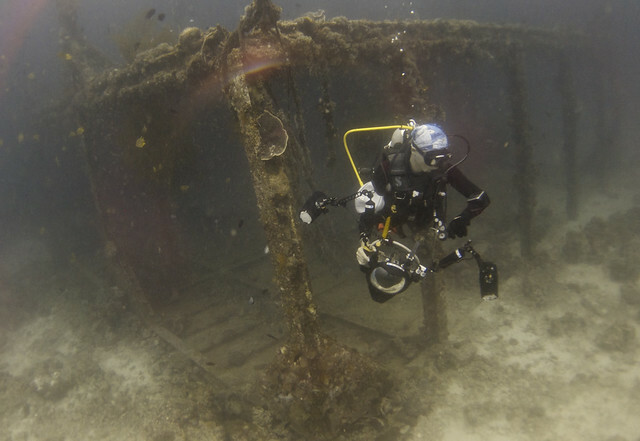 The objective of the initiators of MAD about US had been to train good dive guides for photographers. I’m sure there are handful of really good ones and I’ve heard friends talk about them, but unfortunately I’ve yet to encounter one. We got Edgar who was the guide of Marie years ago when she won MAD about US. She was also the one used by Tet and Marissa the day before, so I was really looking forward. And I was honestly impressed with his briefing before the dive. It was exactly the way Joel said a dive guide should be–confident, knowledgeable of the creatures, and understands the photographers. He was talking about camera positioning, not disturbing the polyps, and the waiting game. I’m not sure if I get little respect with my compact camera, or he only sees Marie as his client since she was the contact, but he totally ignored me (and Zara who has compact too) for all 3 dives that we did. We were only 4 divers, and there were 2 dive guides. I got some good shots that weekend because I look for them, Zara pointed things to me, or I stalked Jerome. The other dive guide? 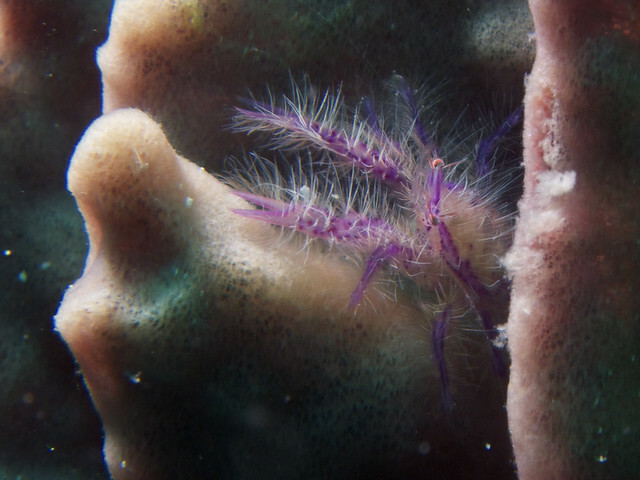 I don’t even remember his name, but he did find this hairy squat lobster and the mushroom pipefish, and occasionally looked our direction. But as we missed a night dive due to the weather, and decided to do 3 dives the next day. We were early and limited our last 2 dives to 60 minutes, although we actually did 70 on the last one. We got back to the resort at 2:00pm. gobbled up our food in 5 minutes, took a look at my over one hundred photos and panicked. I can’t do it! I know I only needed to choose 4 and it’s not like I have one hundred great photos, but I wanted to have more time to sit and look and decide and edit (minimal). I don’t want to regret not giving all the thought I needed later. It was Jerome’s fault. He blurted out he may stay for another night because he cannot finish before 4,30 p.m, the maximum time we had to leave the resort to make it to MAK diver for the submission. You know how when a gate opens, you just couldn’t shut it. Suddenly my mind stopped processing and kept telling me to stay for another night and submit the next day. And so by 3 p.m. I gave in. I wish the submission isn’t so strictly at 5 p.m. I wish they allowed submission up to even 7 or 9 p.m. by dropping off of thumb drive at the organizers’ hotel. Or that they allow us to submit via email. After all, a special date was already assigned during the registration. I don’t think anyone would go the extent of hacking a photo date to win this contest, which can be done anyway even with personal delivery of entries. Many international photo contests uses email as way to submit entries. This resulted in a lot of extra expenses. For example us who stayed for another night, or for some, they went home and come back another day wasting gasoline and toll fees. Anyway, knowing how many people are actually behind the organization of this event, I have to give props for an awesome job. [UPDATE] SO DID I WIN? – actually, yeah! I was in Scotland doing the Isle of Skye tour when I received bunch of congratulations that my wide angle entry won 2nd place for compact camera. Yay! ang astig nung hairy lobster! iba talaga ang beauty ng underwater. The view down under is stunning. It’s not a surprise people really go to Anilao. 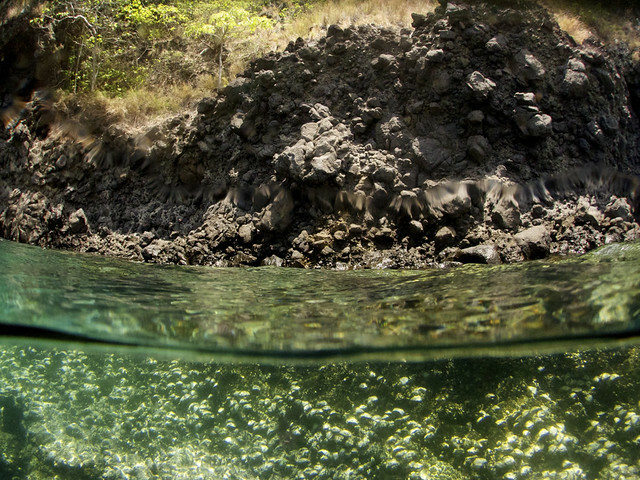 Even though the surface is just a plain boring beach, there’s a whole new world down below. Oh u’re friends with Zaldy who died last weekend. :( :( I actually frequent Planet Dive and Twin Rocks is a favorite site. We almost dived Twin Rocks last weekend but we thought it will be crowded (popular site of the school of jacks) to take any good photos so we decided on other dive sites. I also stayed in another dive resort this weekend. I know people who dove there last weekend and while the current was strong, it was not that strong. It’s a real mystery what happened because both divers died. And I know he is not that new of a diver with 70 logged dives. I suppose the consolation is that they died doing what they loved. I only hope it was quick and that they didn’t suffer too much in the end. May they RIP. It’s really a mystery because we all know that Zaldy is a very able person. I’ve known him through mountaineering, he’s a multi-sports personality. It’s really really sad. That event gave me more reasons not to go on diving, in addition to my fear of the unknown sea creatures that I might encounter down there. Weren’t you afraid that you might chance upon some sea monsters? Lol. I wanna learn and do underwater photography also BUT first I must learn to dive muna. It felt like my heart was ripped to pieces when I read the news yesterday. It’s a challenge to find big patch of beautiful reef where your eyes couldn’t see the end of it. I only remember seeing it in Tubbataha and last month in Balicasag. And to learn that reef twice the size of Metro Manila was destroyed? It’s shocking beyond words.